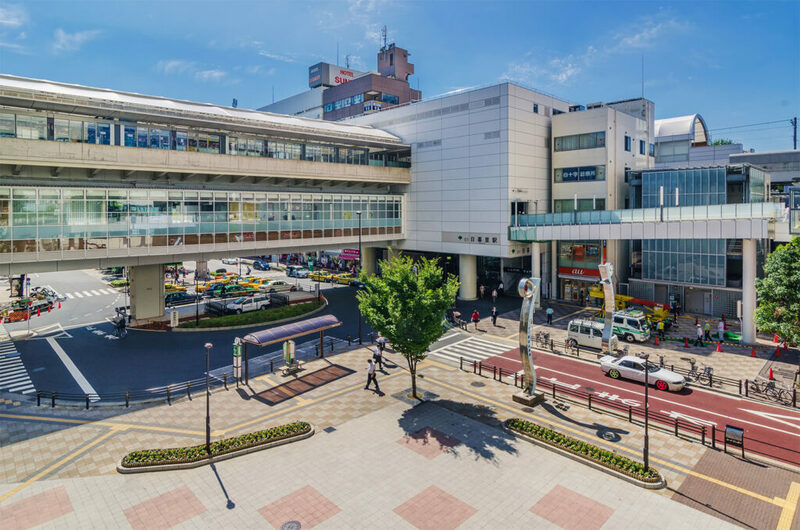 Nippori , which literally means “place where the sun sets”, is a quiet and unassuming area where one can still enjoy the charms of old Tokyo. Nippori Station日暮里駅・にっぽりえき means, “where the sun sets,” and when the sun does set the Fujimizaka area, a 5-minute walk to the west of Nippori Station is the best place in Tokyo to view Mt. Fuji. Come in 十一月じゅういちがつ・November or the end of 一月いちがつ・January for the best views of Mt. Fuji. The economic depression after WWII hit this part of Tokyo pretty hard and as a result the modernity of most of Tokyo never really made it to Nippori. The result of this is that one can find beautiful 木造建築物もくぞうけんちくぶつ・wooden buildings from the Taisho Period大正時代・たいしょうじだい (1912-1926) and bustling street markets selling traditional Japanese food and goods. The Yanaka, Nezu and Sendagi neighborhoods, to the west of Nippori Station are full of these old wooden shops and make a great place to just… get lost. The Yanaka neighborhood, just outside the 南口みなみぐち・South Exit of Nippori Station is also home to Tennoji Temple天王寺・てんのうじ and the 谷中霊園やなかれいえん・Yanaka Cemetery. The Yanaka Cemetery is over 100,000 square meters in area and contains more than 7,000 graves. It’s also the final resting place of 15 Tokugawa Shoguns, including 徳川慶喜とくがわよしのぶ・Tokugawa Yoshinobu, the very last しょうぐん将軍・Shogun. The central Sando road, running through Yanaka Cemetery and connecting it to Tennoji Temple, is lined with 桜さくら・cherry blossom trees and draws thousands of people to see the whitish-pink blossoms in the spring. On the east side of Nippori Station is Nippori Textile Town日暮里繊維街・にっぽりせんいがい, a mile long street with well over 100 fabric and sewing and knitting supply stores. The area was first built during the 大正時代たいしょうじだい・Taisho Period and many buildings from that era still remain. If you’re into quilting or other 裁縫さいほう・sewing or any other craft that uses fabric, needle and thread, you won’t find a better selection of fabric or better prices anywhere else. Nippori Station is also home to two train lines that run out to Narita Airport成田空港・なりたくうこう. The Keisei Limited Express train costs ¥1000 and takes approximately 75 minutes to Narita. If you budget allows it and you want to travel in more comfort then the Keisei Skyliner is the train for you. Recently opened in 2010, the new Skyliner service will whisk you from Nippori Station to Narita Airport in a short 36 minutes. All seats must be reserved the cost of a one way ticket is ¥2400.